Is it possible to make Healthy Triple Chocolate Cookies that taste good? Yes, and this healthy chocolate chip cookie recipe for Chocolate Chunk Cookies proves it. There are several things you can do to lighten the calories in cookies and boost their nutrition. This healthy chocolate chip cookie recipe is a great example. Half of the butter is replaced with canola oil, sugar is decreased, and whole wheat flour replaces some of the all-purpose flour. These are Soft Chocolate Cookies with additional boosts of chocolate flavor from unsweetened cocoa powder, and chunks of both milk chocolate and dark chocolate! Cocoa powder is naturally low in fat and loaded with healthy antioxidants. You can use it to replace some of the flour in baked goods. Remember, one key to indulging in healthy treats like this Chocolate Chip Cookie Recipe is to remember that while you can make cookies healthier, they are not "health food" and should be enjoyed in moderation. This recipe uses coarsely chopped chocolate instead of chocolate chips, but feel free to use chocolate chips if you prefer. 2 ounces of chocolate chips is about 1/3 of a cup. Preheat oven to 350F degrees. Line your baking sheets with parchment paper or use ungreased baking sheets. In a large mixing bowl, mash the butter and sugars with a fork until well combined. Add the oil, egg, and vanilla and beat until well blended and creamy. In a medium bowl, combine the flours, cocoa, and salt with a whisk or a fork until well combined. Add the flour mixture to butter mixture and mix with a large spoon until combined. Stir in the chocolate chunks and pecans if using. Place tablespoons of dough onto baking sheet spaced about 2 inches apart. Bake until the cookies are just set, about 12 minutes. Remove from the oven and transfer cookies to racks to cool completely. This cookie recipe makes about 2 dozen Healthy Chocolate Chunk Cookies. 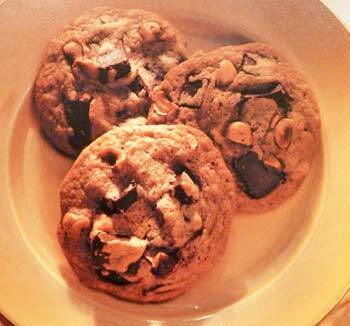 A great collection of low fat chocolate chip cookies that are healthier and taste great. Naturally low in fat with a healthy boost from chopped almonds, these Italian Almond Meringues are just what the healthy dieter ordered and they're delicious too. With just one egg yolk and no butter, low fat biscotti are another great low fat cookie alternative. The rich and chewy cookies are bursting with macadamia nuts and chunks of chocolate and can be appreciated year-round. Preheat oven to 375F degrees. Line your baking sheets with parchment paper or use ungreased baking sheets. In a large mixing bowl, cream the butter, shortening and sugars until light and fluffy. Add the flour and baking soda and mix well. Fold in chocolate chunks and macadamia nuts and blend until thoroughly mixed throughout the cookie dough. Drop large rounded tablespoonfuls of dough onto baking sheet spaced about 3 inches apart. Press down lightly on top of each cookie to slightly flatten. Bake until the cookies are lightly browned, about 10 to 12 minutes. Remove from the oven and transfer to wire racks to cool completely. 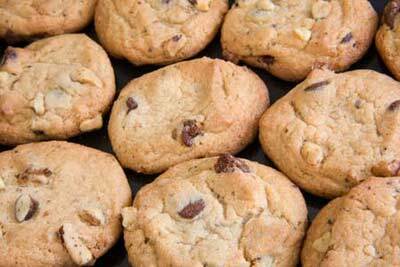 This recipe makes about 1 1/2 to 2 dozen Chocolate Chunk Macadamia Nut Cookies. These cookies are for the sophisticated sweet tooth—crisp and buttery, with chunks of bittersweet chocolate and toasted hazelnuts. It's hard to think of a better cookie recipe! Spread hazelnuts on baking sheet in a single layer and bake for 12 to 15 minutes, until lightly browned and skins begin to crackle. Wrap nuts in clean kitchen towel and let them stand 5 minutes. Rub nuts in towel to remove skins, then cool completely and chop coarsely. In a medium bowl, stir together flour, baking soda and salt. In a large mixing bowl, beat the brown sugar and butter with an electric mixer on medium speed until light and fluffy. Beat in eggs, one-at-a-time, mixing well after each addition. Gradually add the flour mixture while beating on low speed, just until combined. Stir in chopped chocolate chunks and chopped hazelnuts. Drop by heaping teaspoonfuls onto ungreased cookie sheets at least 2 inches apart. This recipe makes about 3 dozen Ultimate Chocolate Chunk Cookies.